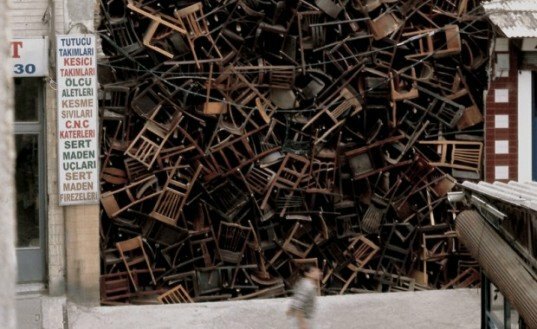 Artist Doris Salcedo thought-provoking art transforms reclaimed items of furniture into politically charged sculptural work. In 2003 she took over a derelict spot between two buildings in Istanbul, stacking 1,500 chairs on top of one another that towered over passers-by like a small building. The chairs were piled in disarray, the huge number of items serving as a memorial to the many faceless members of society whose lives, work and even disappearance goes by unnoticed. Built for the 8th Annual Istanbul Biennale, the Colombian artist worked with a similar concept in her piece ‘Noviembre 6 y 7’ in 2002. Here she had lowered wooden chairs slowly over the facade of Bogota‘s Palace of Justice in commemoration of the 1985 political massacre. 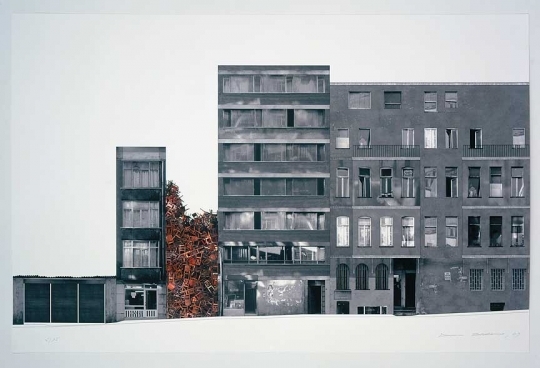 Salcedo unearths memory and interweaves personal stories within her colossal artworks, transforming and renewing sites of specific architectural, geographic and political importance. She reuses objects while remaining sensitive to the individuals she is trying to represent, ultimately creating timeless, evocative art. Artist Doris Salcedo makes thought-provoking art from reclaimed items of furniture, transforming the objects into politically charged sculptural work. In 2003 she took over a derelict spot between two buildings in Istanbul, stacking 1,500 chairs on top of one another that towered over passers-by like a small building. The chairs were piled in disarray but level with the building facades each side, a way of memorialising faceless victims of society whose disappearance or work goes by unnoticed. Built for the 8th Annual Istanbul Biennale, the Colombian artist worked along a similar concept in her piece 'Noviembre 6 y 7' in 2002. Here she had lowered wooden chairs slowly over the facade of Bogota's Palace of Justice in commemoration of the 1985 political massacre.